After two pretty disappointing effort against the Canadiens and Bruins, the Rangers (16-6-2) continued their losing streak to three straight with a 3-0 loss at the Garden with Raanta in net. It was the second meeting of these teams. The Flyers took the 3-2 win in the last game in a shootout in Philadelphia and have now gone 2-0-0 on the season. They broke an eleven game losing streak at the Garden with the win. In Friday’s matchup against Boston, Derek Stepan took a hard hit, and two of his ribs were broken. He is out indefinitely as of right now. Coach Vigneault’s decision was to give Hayes a chance at center in Stepan’s absence, with Kreider on the left and Etem on the right. After two disappointing losses, the Rangers (16-5-2) were handed another tough pill to swallow, losing center Derek Stepan for an indefinite amount of time after he broke some ribs following a late hit from Bruins winger Matt Beleskey. 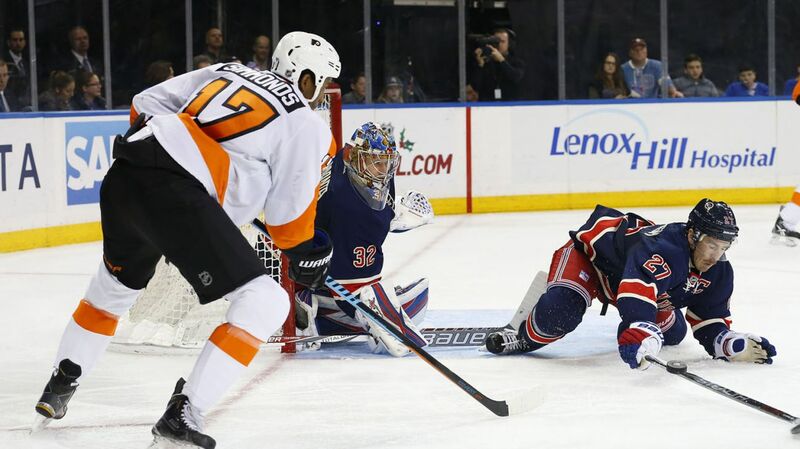 That means that Vigneault will have to adjust his squad accordingly as they prepare to take on the Philadelphia Flyers (8-10-5) for the second of five matchups between the longtime rivals, and the first of two games at Madison Square Garden. After a shockingly poor performance against the Canadiens, the Rangers (16-5-2) came out and played better, but could not win as the Boston Bruins (13-8-1) secured their fifth consecutive win by a final score of 4-3, with some help from the officials. It was an intense back-and-forth affair with a lot of aggressive play, typical of a rivalry matchup we’ve seen from these two teams over the years. Despite an improved performance and steadfast play, a pair of late goals swung the game in Boston’s favor.